Since H2 of 2017 economic growth has recovered from low copper prices and lower demand from China, strikes in the mining sector and weaker domestic demand. Sebastián Piñera of the centre-right “Chile Vamos” coalition won the run-off presidential elections in November 2017. He took over from centre-left Michelle Bachelet. No significant policy shifts are expected by the new government, and therefore political stability remains high, supporting Chile´s creditworthiness and positive financial markets sentiment. However, addressing bottlenecks in human capital and social inequality are persisting challenges for the new administration. 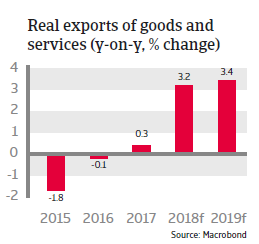 Chile´s economy remains dependent on copper exports (accounting for more than 40% of export earnings and 10% of GDP) and subsequent demand from China. However, dependence of government revenues on copper earnings has decreased from more than 25% in the past to about 10%, and more diversified export destinations have mitigated trading risks. Meanwhile, the service sector accounts for more than 60% of GDP. 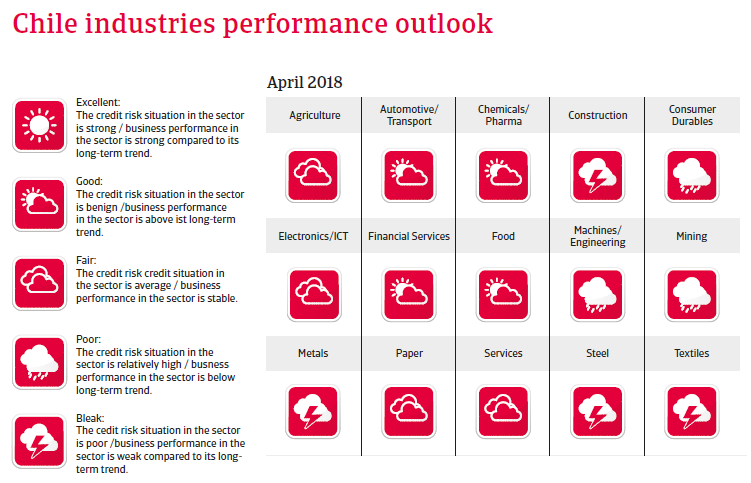 Since H2 of 2017 economic growth has recovered from low copper prices and lower demand from China, strikes in the mining sector and weaker domestic demand. 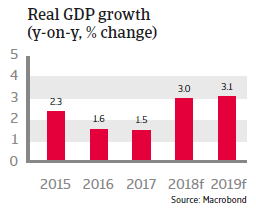 In 2018 and 2019 GDP growth is set to accelerate due to a more supportive external environment (higher copper prices and increased commodity demand), the impact of monetary policy loosening in 2017 and improving business and consumer confidence. 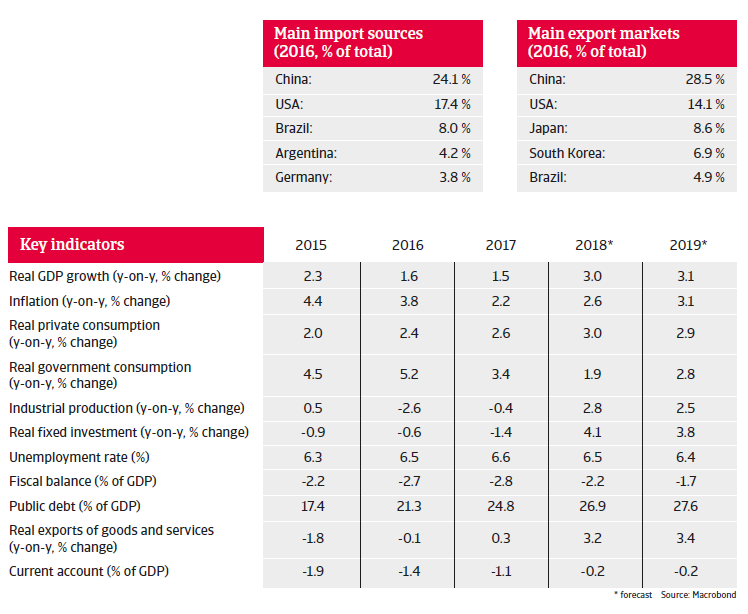 While Chile´s commodity industry could benefit from large-scale infrastructure projects in the US, the economy could be adversely affected by US protectionist trade policies directly (in its trade with the US) and indirectly (via a potential slowdown in trading with Asian countries, Brazil and Mexico). Any disturbance of global trade flows by new protectionist measures would definitely impact Chilean exporters, despite the fact that the country has bilateral and multilateral free trade agreements with more than 60 countries. That said, the economy´s shock resistance remains strong, given prudent macroeconomic and financial policies. A flexible exchange rate has served as an effective shock absorber, mitigating the impact of low copper prices and subdued external demand on Chile´s current account. External debt is sustainable (with ratios expected to decrease to about 60% of GDP in 2018 and 2019) and liquidity remains sufficient with more than six months of import cover, additionally underpinned by a Sovereign Wealth Fund that currently amounts to USD 24 billion or 9% of GDP. 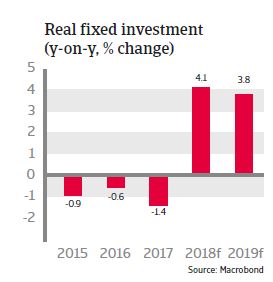 Chile has a fiscal rule that sets a structural surplus target, but offers space for stimulus policies in the short term. While public debt has increased in recent years, its structure remains low risk: most of it is peso-denominated (82%) and domestically held (80%; i.e. pension funds), mitigating currency and refinancing risks. The Chilean business environment remains one of the best in the region and the government continues to stimulate foreign investment. Good access to foreign and domestic capital by local companies reduces refinancing risks. Chile´s banking sector is healthy, well-regulated and sufficiently capitalised, with low non-performing loans (about 2% on average). Liquidity is good and authorities are in the process of implementing Basel III regulatory frameworks. However, a relatively high loan-to-deposit ratio of more than 115% makes the banking sector vulnerable to shifts in market sentiment.